Most of the text in this introductory section, especially in the section "The Fearless Physics of The Renaissance", is too abstract and philosophical to be appropriate in a book of this sort. Are you asking now why some API design advices feel so unnatural? Why they are so different compared to the best practices that we learned while working on our small projects or on in-house projects of any size? The reason is that even a small shift in the initial conditions may result in completely opposite advice which may seem [[paradox]]ical. However that does not mean such advice is not useful and the [[Paradoxes of API Design|chapter 14]] describes some of them and explains why adhering to them may be beneficial for any software project. The introduction here is too talky. The reader will want to continue delving into API; as fun as waxing philosophic may be, I think it impedes the flow here. 1 Have You Ever Wondered...? 3 What is a Paradox? Paradoxes of API Design is a title of one of the chapters of the Practical API Design book by Jaroslav Tulach. However the title is so strong, that it could even be used as a short summary of the whole area of API design. In case you find the discussed topics interesting, consider purchasing the Practical API Design book, get the slides, see the high resolution version of this video. In case you speak Czech, you may be interested in hearing my Ostrava JUG Mar 2nd, 2011 presentation on the same topic. The interest in this presentation grows, I gave yet another one on May 10, 2011 at GeeCON in Krakow. Finally I managed to talk about paradoxes at JavaOne. I guess now I should invent new topic to talk about or at least turn the presentation into a book. Soon after publishing Kant's Critique of Pure Reason, Kant realized that nobody is able to read it all and he released his Prolegomena to summarize and re-explain in more understandable style the thoughts of his Critique. I'd like my Paradoxes to do the same to TheAPIBook with the hope to attract wider audience to the topic of API design and convince part of them that it is worth to buy TheAPIBook. The book is now available for download at Amazon US and mirror sites, including Amazon GB. Those who prefer other formats and readers than kindle may take a look at Barnes & Noble site. I've got a chance to to talk about 20 API Paradoxes at JDD 2013 and here is the recording. It explains bits of history and introduces some nice quotes. I still like the "Nathan shown on Monday they can do a bit of philosophy in the U.S." rant, which refers to Nathan's previous Epistemology talk. 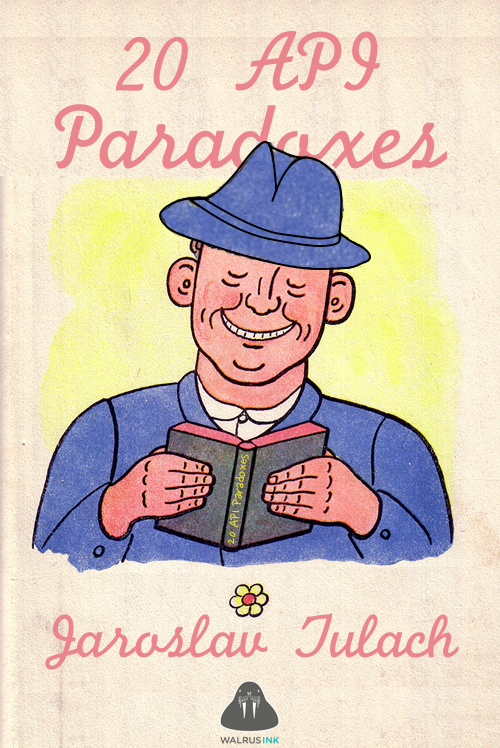 If you liked watching the video, consider buying 20 API Paradoxes or TheAPIBook. The Chapter 14 contains a note about the importance of trust in the APIDesign. If you broke your promise of BackwardCompatibility once, you repel clients of your API to alternative offerings. It is hard for them to believe that they should once again build their application on top of your API and risk similar problems again. Does that mean we need more BackwardCompatibility in our APIs in order to prevent collapse of software industry comparable to the one on financial markets? There seems to be a significant shift in the way people treat their promises these days. In the MiddleAge, when two knights agreed to rendezvous in Paris after spending ten years on battlefields, they had no choice other than to be at the designated place at the designated time. Otherwise, there would be no chance that they would ever see each other again. The MiddleAge promise could last years. Nowadays, when you want to meet with someone, you simply negotiate the approximate date and an hour of the meeting and phone the other to confirm validity and settle details. Mobile phones are the root cause of modern people being able to break their original promises! This affects how the whole society behaves and also how (lightly) many developers treat their promise of BackwardCompatibility. In the context of the MiddleAge comparison, does it make sense to believe a contemporary developer promising: Our project is in a development stage, but once we reach version 1.0 we'll keep compatibility? If you are thinking about developing an API in stable way, which you should, commit to it now, during the first release. There is no reason to wait. Otherwise, you are at risk of not keeping your own promises. What drives me mad is that some people are even proud of doing that! In one useless conversation, while trying to convince people to stick to their previous promise, I heard the claim that, If there is a rule that says I should waste my money on something, then I am personally quite willing to ignore it and even congratulate myself for doing so. I have the feeling that nothing illustrates the current state of our society better than this quote. People are not willing to keep a promise if it’s even slightly inconvenient. However, there are still certain areas where promise and trust are more important than profit. I have a few friends working for various banks as stock dealers, where they all work with promises. If they want to make a deal, they call another dealer, negotiate the price over the phone, and as soon as they say “Done,” the deal is made. Of course, no money is transferred yet. That is the work of the back office and is delayed by a few days. During that time, the deal might fall through and the bank might be tempted to cancel it. However, I have not heard about this ever happening. Even if the bank stands to lose money on the particular transaction, there is always a much higher cost: loss of trust. Because all the operations among the dealers are based on mutual trust, if you break your promise once, rumors spread and nobody is going to do business with you anymore. No bank wants to risk that. Although I might be wrong, I see APIDesign as another place where trust is more important than cost savings. The contract between the designer of an API and the API’s users is built on mutual trust. Breaking that trust is the last thing you want to do, as that can only help you lose your biggest asset: the users of your API. That is why it’s more efficient to spend a few bucks more to implement a compatible extension to your API, than to seek the most cost-effective solution at the expense of good relations with your users. Still, in light of the erosion of promises in our modern society due to mobile phones, it’s safer to eliminate “future” promises, replacing them with real and immediate actions. Those who care can produce good APIs without that exception anyway. If people want to make promises, they should do so immediately. Promising heaven in the future doesn’t count. This page was last modified 10:26, 5 November 2018. This page has been accessed 37,072 times.